This past week the Congressional Budget Office (CBO) released their budget projections for FY 2018 through FY 2028. 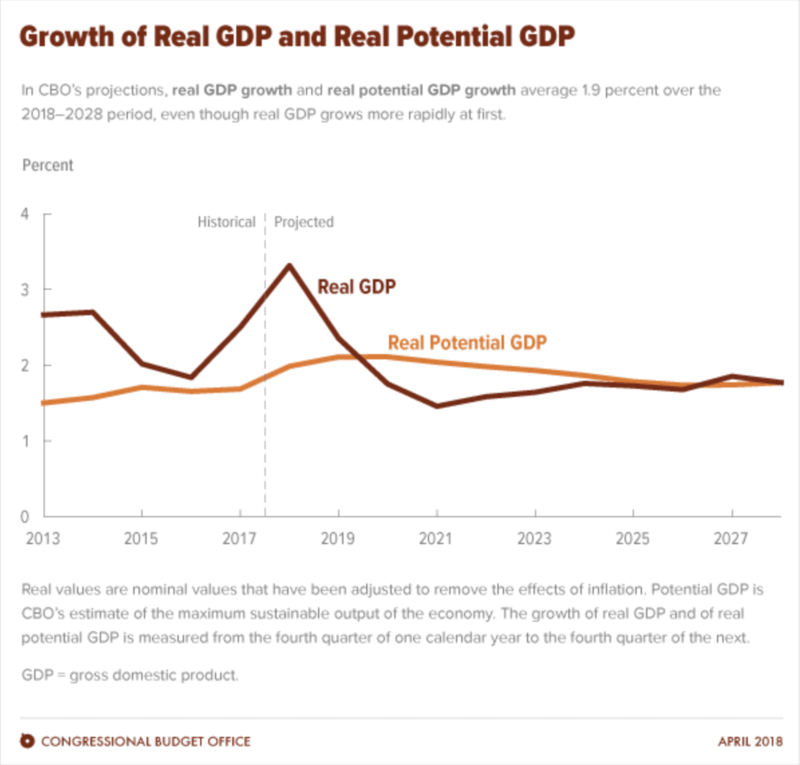 The budget projections include a host of assumptions on things like GDP growth, potential GDP growth, interest rates, employment, revenues, and expenditures, to name a few. Within the CBO information lies an assumption on a number that can, at times, have an impact on market participants (the impact is mostly indirect, but the influence is still there). The figure is the projected GDP growth rate over the next 10 years. If you don’t already know the figure, what would you guess they assumed? Would you guess they assumed something like 3% GDP growth – the figure the Trump Administration used when releasing their budget proposal? If you’re a student of politics, you likely know that the CBO is almost always more pessimistic than the President’s Office of Management and Budget (OMB), and thus projected a lower growth rate. But, how much? Would you guess 2.6% – the growth rate we saw in 2017? Perhaps something in-between, like 2.75%? Interestingly, the CBO assumed an average annual growth rate of 1.9%. Is this realistic? And, does it even matter? The answers to these two questions largely depend upon whether markets and the public care about the agenda of the CBO. What does this have to do with the assumption on GDP growth? Well, if one assumes 1.9% GDP growth, then the tax cuts never pay for themselves - at least not within the next 50 years. By contrast, if one comes in with GDP growth of 3%, then the tax cuts could actually pay for themselves. Here's the math. 3% GDP Growth or 1.9% GDP Growth? First, here's the baseline revenue from FY 2018 to FY 2028 assuming 1.7% GDP growth - which is what the CBO assumed back in June 2017. 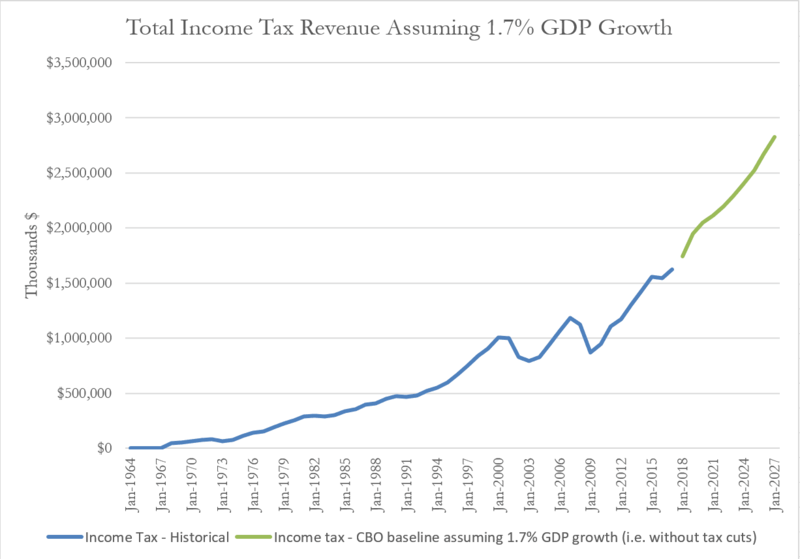 As shown, income tax revenue continues to grow. Now, lets assume 1.9% GDP growth, which is what the CBO released this week. As shown below, income tax revenue is slightly stronger, but not strong enough to cover the "static" loss in revenue from the reduced income tax rates. Now, lets assume 3% GDP growth. Here's the revenue picture with 3% growth. As indicated, the purple line (3% GDP growth) is much stronger than the other two revenue pictures assuming either 1.7% or 1.9% GDP growth. How much is the difference? Assuming 1.9% GDP growth, the tax cuts reduce income tax revenue by about $1.2 trillion over 10 years. 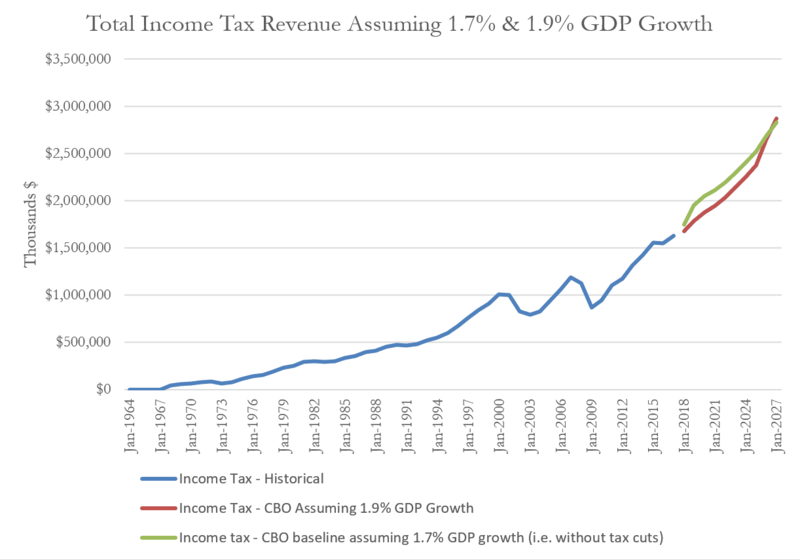 If one assumes 3% GDP growth, the tax cuts increase income tax revenue by $544 billion. Ah, who would have thought the difference between 1.9% and 3% would be that big. GDP growth and Tax Cuts - is It? 3% or 1.9%? With such a large difference between the two figures, which one is right? Well, that depends upon your philosophy on life and a host of other factors. All we know so far is that GDP growth is stronger since the tax cuts were put in place and that economists generally hate the idea that tax cuts would pay for themselves. Is it initial evidence versus a preconceived bias? 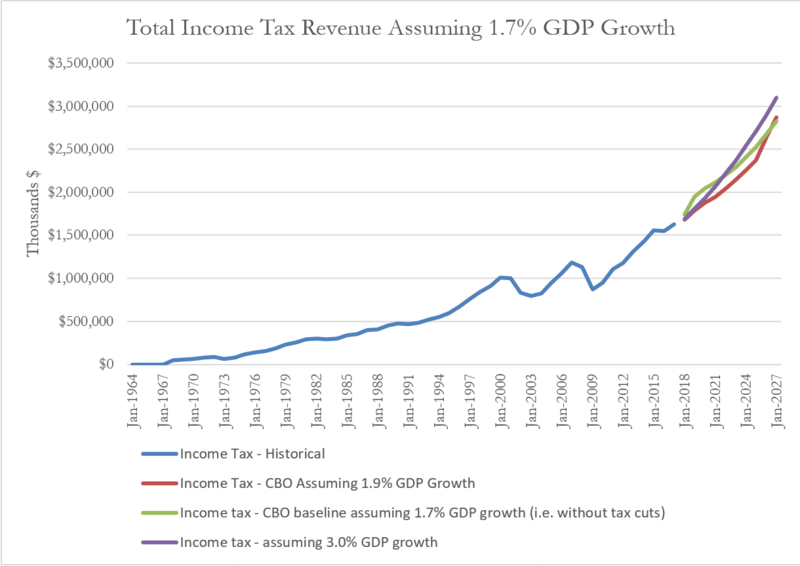 Overall, if one assumes 3% real GDP growth over the next 10 years, then instead of a decrease in income tax revenue from the federal tax cuts, income tax revenue actually rises by $544 billion. If one assumes only 1.9% real GDP growth, then the tax cuts reduce income tax revenue by $1.2 trillion. Hmm. What to believe?